Instead of taking away from someone by judging them or condemning them, what would happen if we were to give to the person instead? Give a smile, a moment of our time, a listening ear, the benefit of the doubt. How would that change another person’s day? How would it change mine? This sort of attitude changed St. Patrick’s life. He could have been excused for condemning the people who kidnapped him and sold him into slavery in Ireland. That would have been an understandable response. But instead he returned to the island as a bishop and brought the entire country to belief in God. Because Patrick chose to give rather than to take, he became a powerful force for good in the world. He became a saint. 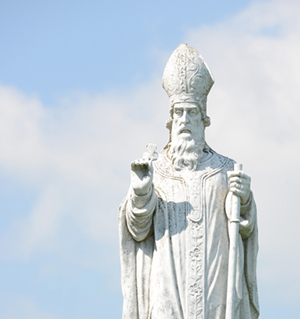 May St. Patrick pray for us for the grace to give rather than take, to be a presence for good, the presence of God, through our own lives.